From Beverly Hills mansions to Irish country lanes, super-yachts to side-alleys, howling cougars to psychotic nutters, stand-up spotlights to police helicopter searchlights, superstar highs to inner demon woes, along with so much more, Mark Hayes takes us on quite an adventure in RanDumb-er, the random but hardly dumb tales of an Irish chancer. 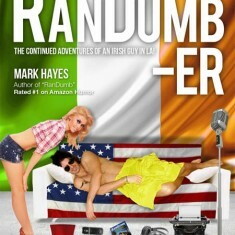 From one side of the world to the other, in and out of the fantasy of Mark’s reality, all with a smile and a belly-aching laugh, RanDumb-er will draw you in and make you believe in the spirit of your inner five year old once more! Go ahead – Open a Guinness, take off your pants (comfort is key here), sit back, relax and enjoy the show. Fast pace, quicker wit, time for you to join Mark as he tells his story of two cities and one dream. Ran. Dumber. On!